The Waimea Consort will sing works written mostly by medieval and renaissance composers such as Pérotin, Dufay, Gabrieli or Sweelinck. It will also give the first performance in Hawaii of "Les deux Cités" by 20th century composer Darius Milhaud. 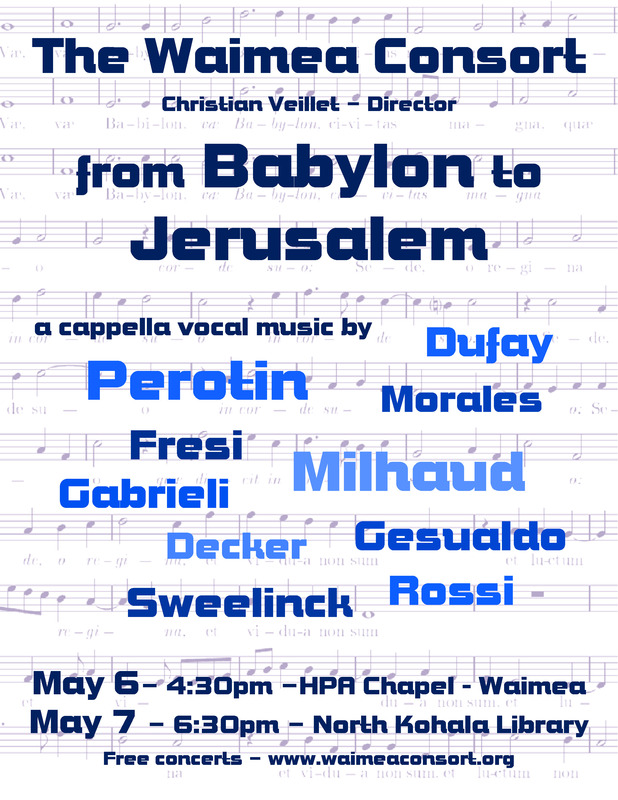 From the rivers of Babylon to the Temple of Jerusalem, from the fallen Babylon to the New Jerusalem, both cities have inspired amazing choral pieces from the early days of polyphony to the present times. 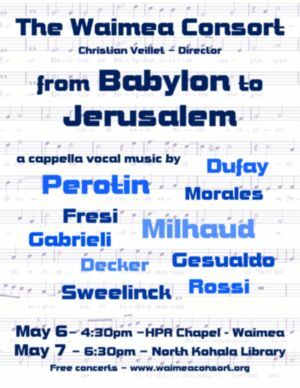 For its Spring 2012 program, the Consort will bring to the Island of Hawaii works mostly written by composers from the medieval and renaissance era, with Dufay, Gabrieli, Gesualdo, or Morales for pieces on Jerusalem. Babylon will be highlighted by Psalm 137, set in French by Goudimel and Sweelinck, and in its original text (Hebrew) by the Italian Jewish composer Salamone Rossi. "Les deux Cités" (The Two Cities) by XXth century French composer Darius Milhaud will bring Babylon and Jerusalem in a stunning choral triptych, full of challenging sounds and complex voicing. A couple of surprises from the early days of polyphony and the beginning of the 21st century will be added to this exciting program: a unique opportunity to hear live rarely sung jewels of the a cappella repertoire.